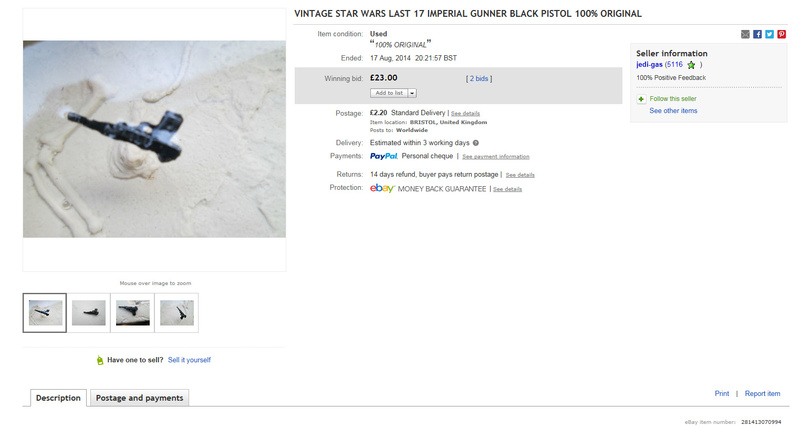 Does anyone know this ebay seller jedi-gas as he sold a couple of weapons over the weekend which to me have serious red-flags. Now if you remember I pulled mine from the Droids guide and it looks just like the one in the auction photos. I still have mine at home and here are some photos taken yesterday showing a side by side comparison with a genuine one. I also conducted a float test. 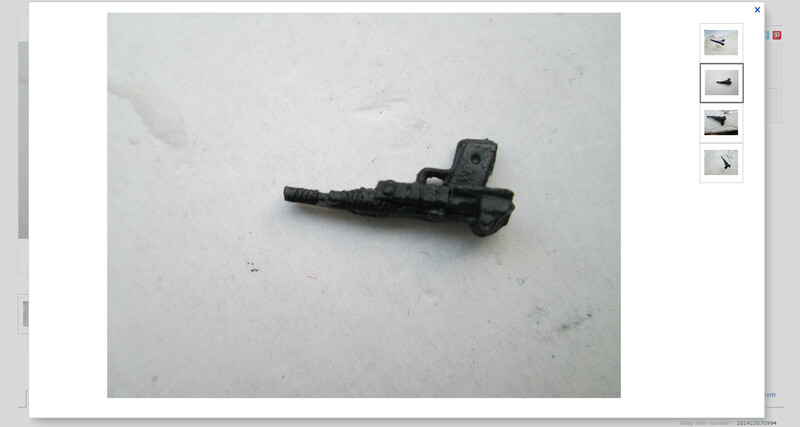 You can see from the photos that the mould is very poor and nearly all the definition on the barrel is missing. 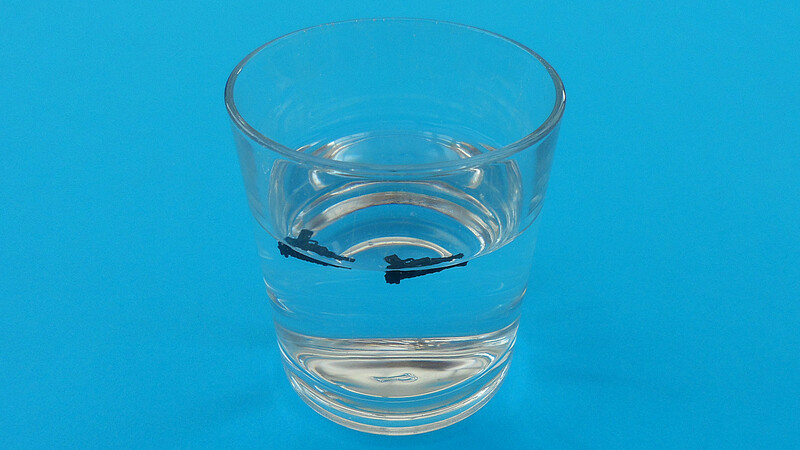 However as demonstrated in the ebay auction this item will float! So what is everyone else's opinion on this? 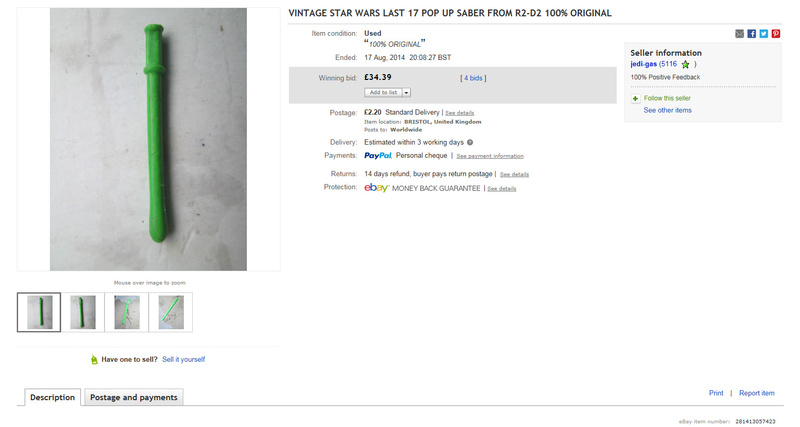 Now I'm 100% sure this item is REPRO, again it passes the float test but the material is unlike any other pop-up saber, even the foreign variants. The mould is again poor and you'll notice the EPM circle is lacking definition. are you sure your droids card wasn't a reseal??? 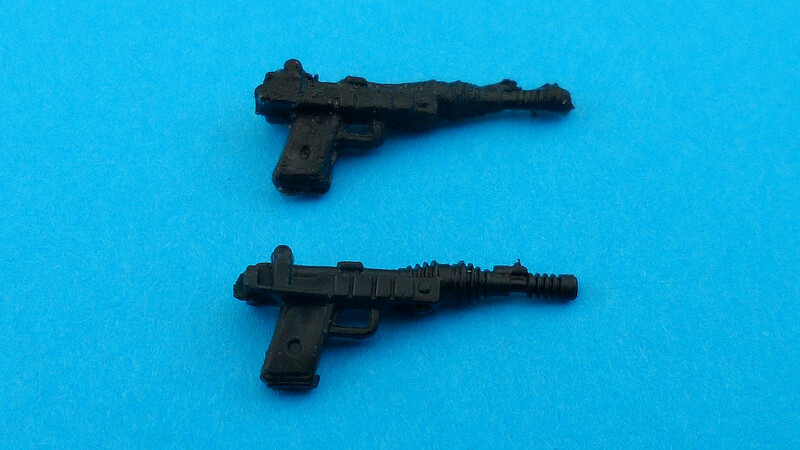 I know these blasters for a long time! I sent a pic to Jay as the gunnery was built...he never put it on the site for whatever reason, but these are out there. The mold is worng IMO. 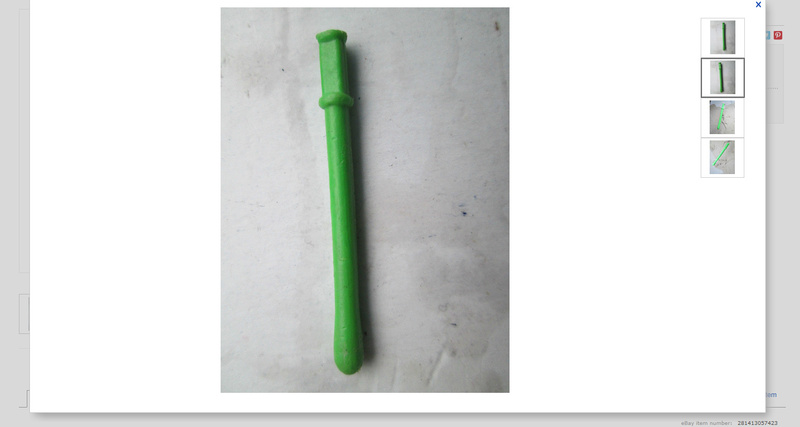 The cast is poor and it is a cast (mine) , because it has airbubbles, so no injection mold, so not factory produced! I can see airbubbles on yours too btw! Yes I agree, the photos with the blue background are mine. The top poorly cast one (with air bubbles) is fake and most likely a recast and I'm happy to agree with this. Only the bottom one is genuine IMO. AJ, I think your right as they have a similar poor mould. 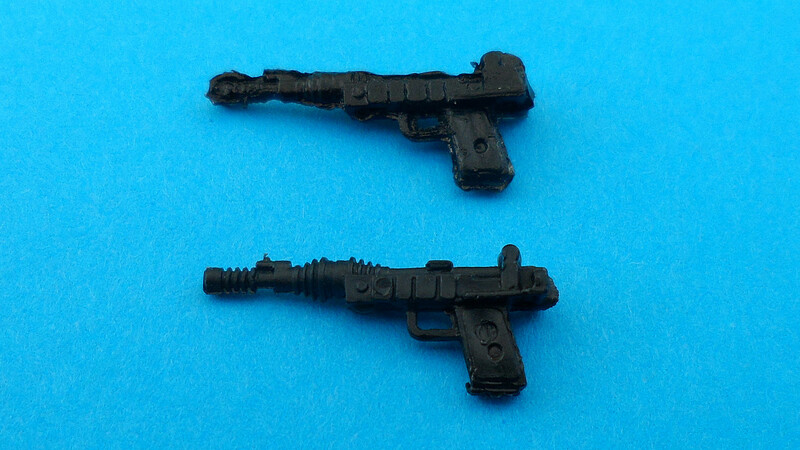 So now we have the Imperial Gunner/A-Wing Blaster and Lando's Palace blaster, and maybe a Jawa Blaster (unconfirmed). Correct AJ...it was the palace blaster! 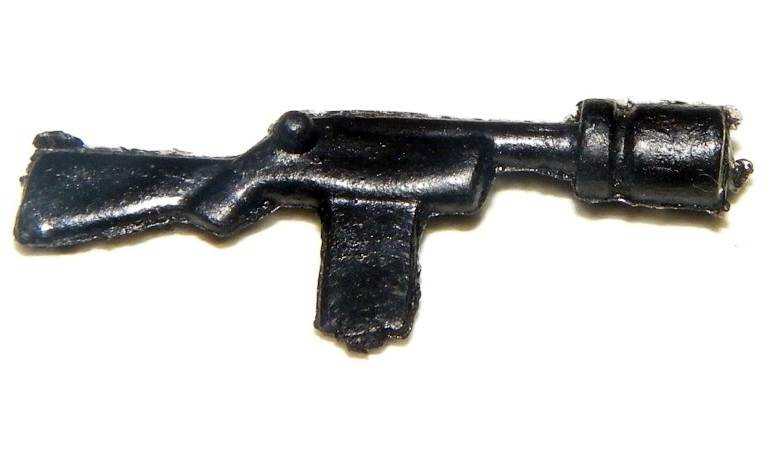 Stef: The Jawa blaster is confirmed. All float! I am guessing there is also an imperial blaster....but I never saw one. All those ONLY come in black....the flost but the airbubbles and the poor mold are good signs to spot those! Isnt the Jawa blaster in the archive?? Please out the seller that has sold you that fake balster on a droids card! Should we add these new repro's to the guide? they seems to have been around for 10 years now. I wonder who brought the items of ebay? ?, probably best to share the info over on the other forums.